Although many migrants had cleared out there were still plenty of new ones to look for, the best new discovery being a GREENISH WARBLER found in the early afternoon in the Italian Gardens along South Cliff which showed on and off for nearly two hours before moving off. 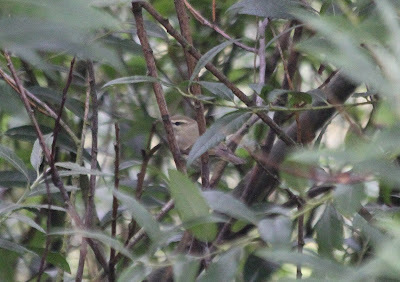 Commoner migrant totals were 1 Cuckoo (Hundale), 1 Whinchat (Ravenscar), 3 Redstart (Ravenscar, Castle, South Cliff), 3 Wheatear, 5 Whitethroat, 2 Blackcap, 2 Garden Warbler, 8 Willow Warbler,10 Chiffchaff, 2 Pied Flycatcher (Hundale, Castle) and Spotted Flycatcher (Crook Ness). Over the sea (south unless stated) were 1 Red-throated Diver, 4 Manx Shearwater + 8 north, 1 Sooty Shearwater north, 3 Cormorant, 1 Mallard, 111 Teal + 6 north, 41 Common Scoter + 19 north, 33 Oystercatcher, 1 Turnstone, 20 Redshank, 2 Whimbrel, 11 Arctic Skua + 2 north, 3 Great Skua and 2491 Kittiwake north. Elsewhere 2 Sand Martin at Harwood Dale, 3 Ruff near Staxton and 15 Turnstone were in the Harbour. Late news for yesterday, 2 Pied Flycatcher at Night Point.